Heat the butter together with the oil in a large saucepan or casserole over medium-high heat. Once the butter has melted and is bubbling, add the chopped chile and cook for a minute, stirring frequently, until softened. Incorporate the corn and cook for a couple more minutes. Pour the water over the corn mix, add the chopped fresh or dried epazote (or cilantro) and salt. 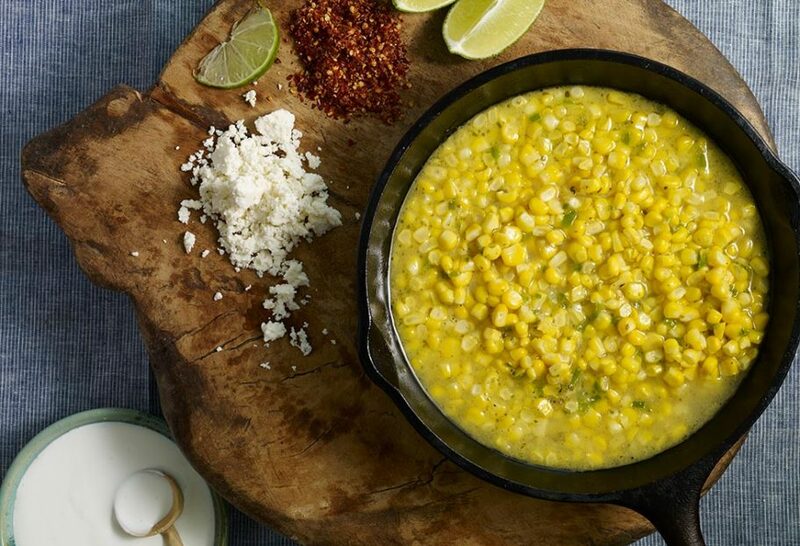 Stir and bring to a simmer, cover, reduce heat to medium-low and cook for 12 to 14 minutes, until the corn is completely cooked. Turn off the heat. You may leave the corn in the pot for a couple hours. Serve the corn in cups or small bowls. Let your guests add fresh lime juice, mayonnaise or Mexican crema, crumbled cheese, powdered chile piquín, and salt to their liking. Had a dinner to attend and to bring a dish for it. My stepfathers fresh corn had just come in. Made corn in a layered casserole dish for serving a large group easily. Corn was cut off cob and cooked with milk and butter and sliced jalapeños. Poured into dish and covered with grated cotija cheese. Cooled. Topped with a Very light layer of mayo and sprinkled with ground Chile guajillo and garnished with fresh cilantro. Refrigerated until serving. The people acted like they had just discovered corn. Not a bite was left. You are such an inspiration for whatever I make. Thanks.